How will the 'robot revolution' affect your job? How will the ‘robot revolution’ affect your job? Almost every day Science Fiction loses a little more of it’s fictional quality. Between wearable tech and computers that can think as quickly as the human brain, there’s a palpable atmosphere of fear and amazement within the tech world. The fear being the anxiety associated with redundancy. Why hire a person when a robot will do the job 24/7 and more efficiently? The tech world is calling this impending phenomena the Fourth Industrial Revolution. A new report from The Future of Jobs has revealed the global loss and gain of jobs when the robot revolution hits full swing. The findings are similar to previous calculations that showed that mechanical workers would eradicate as many as 47% of jobs by 2050! But don’t despair just yet. As one door closes, another one opens (probably automatically mind you, the robots are everywhere). Jobs in the teaching, coaching and interpretation sectors will be safe, as opposed to the energy, healthcare and financial industries. 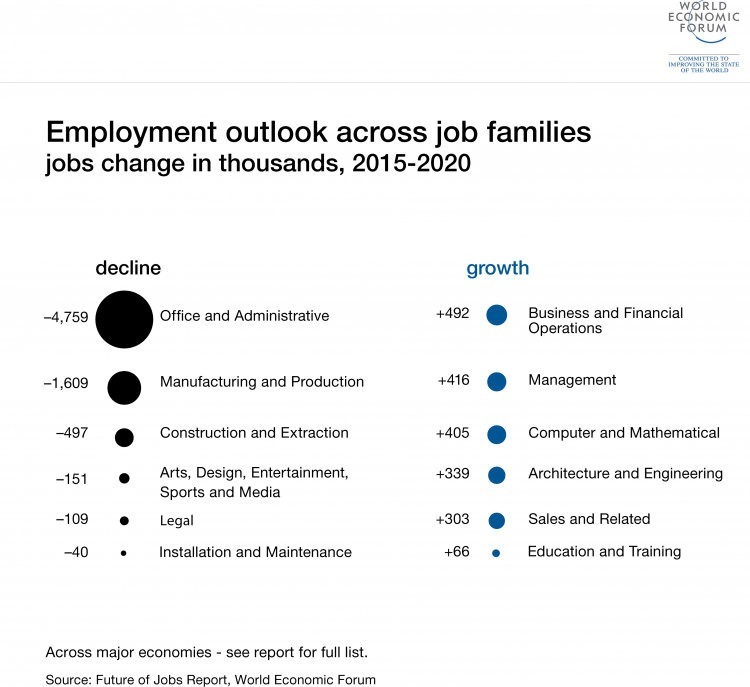 Take a look at the diagram below to see if YOUR industry will be affected by our new robotic overlords and whether it’s worth considering a career change to something more stable. However, changes in the job market are hardly news. The world is constantly in flux and as new technology develops and new industries flourish – opportunities will arise accordingly. Have faith in your abilities and in your humanity.